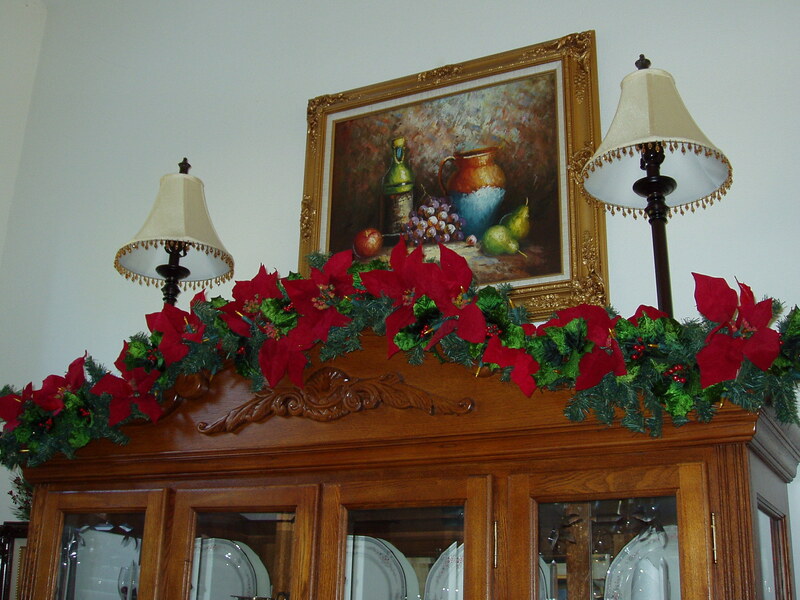 There is one item in a house that we normally do not think of as a decorative piece of furniture; it is the dining room china cabinet. 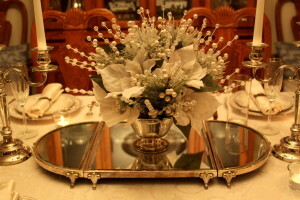 Most people would think the only function of a china cabinet is to store their fine china dinnerware, crystal glasses or silver serving pieces when they are not being used for a formal luncheon or dinner in the dining room. 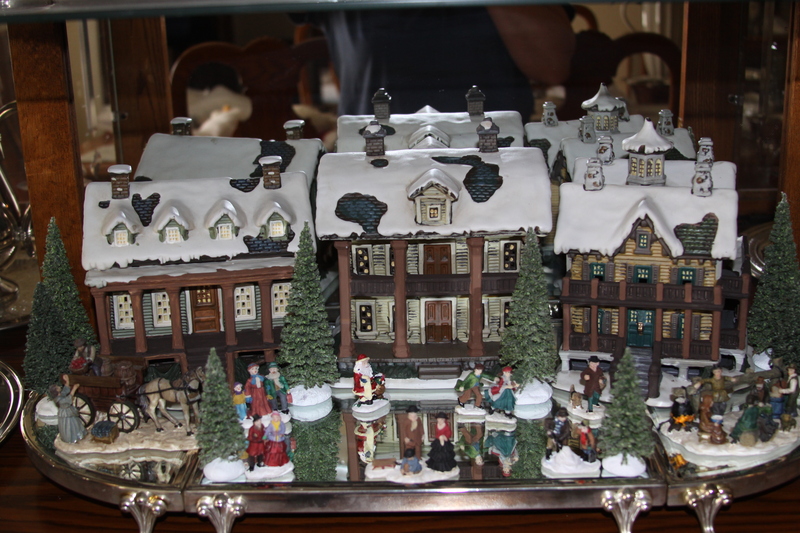 In this post I am going to show how I display the items in our china cabinet and also how I change some of the decorative items seasonally throughout the year for many different holiday styles. 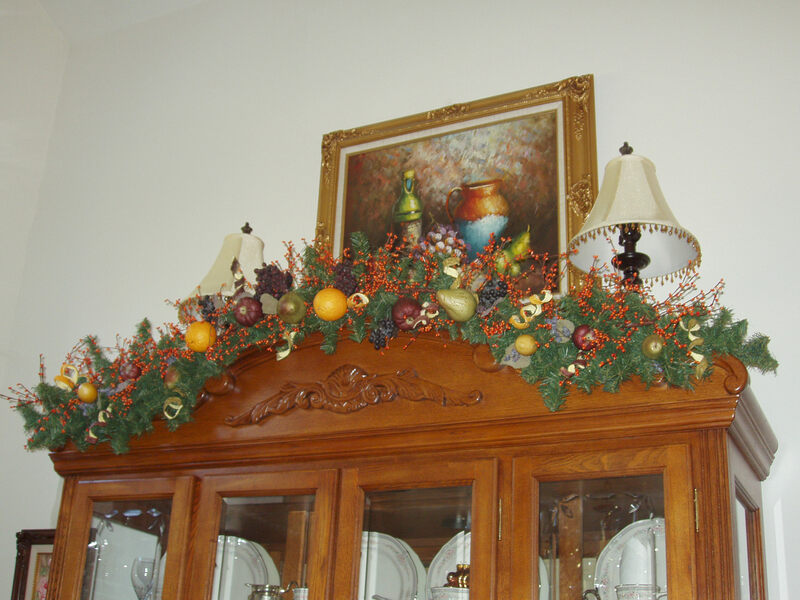 Shown below is a photo of how I have decorated our china cabinet and this is how it looks during most of the year and I am sure it looks a lot like a typical china cabinet display. 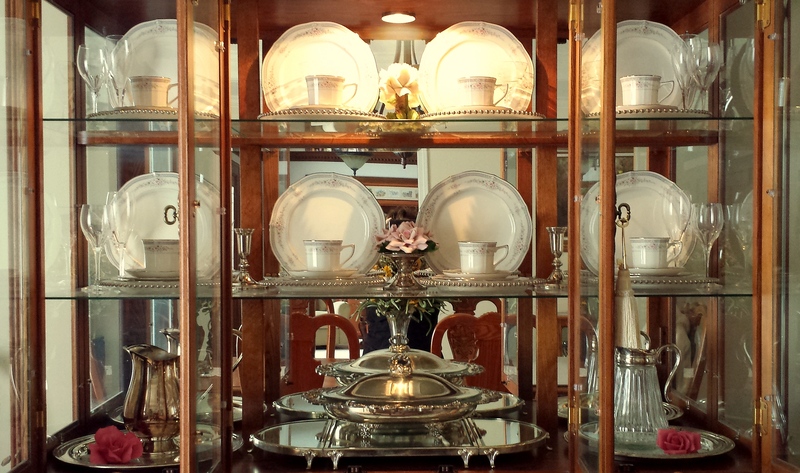 Inside on the top two shelves of the china cabinet I have displayed pieces from our Noritake Rothschild china; each of the eight place settings has a dinner plate, luncheon plate, salad or dessert plate, soup bowl and cup/saucer. 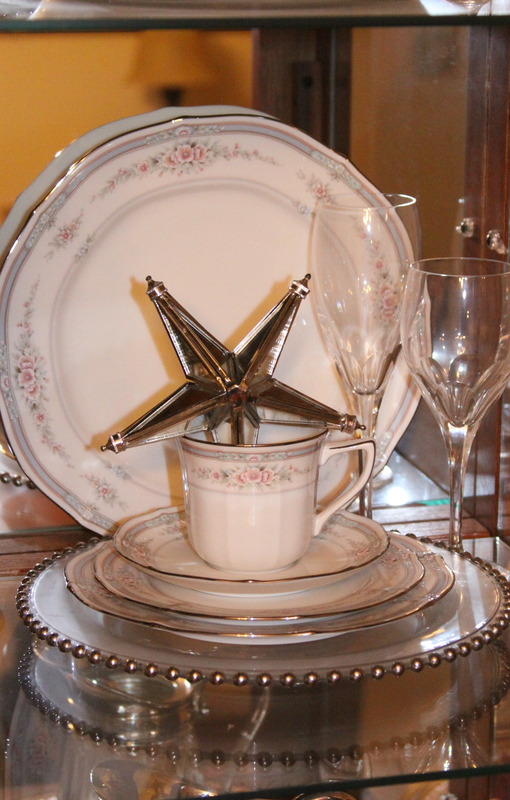 The china is very special to me because it was a wedding gift from my mother. To add some interest to the cabinet I have displayed the dinner plates on edge so the delicate floral pattern of the plate is shown, there is a groove on the glass shelf to prevent the plates from moving. I also have added eight glass and silver plate chargers that are displayed beneath each of the stacked place settings. 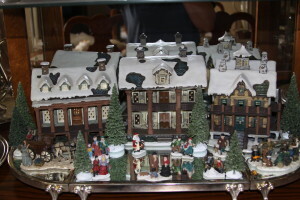 The last decorative items that are displayed in the china cabinet are several Napoleon Capodimonte porcelain rose figurines. On the top shelf is a Napoleon white porcelain rose figurine which I had given to my mother as a birthday present many years ago because white roses were her favorite flower. When she died recently the piece came back to me and it is displayed near my mother’s vintage glasses. On the second shelf I have displayed another Napoleon porcelain rose figurine, the cluster of roses are a beautiful pale pink and the figurine is set on a small silver candleholder which I’ve used as a stand. On the bottom shelf of the china cabinet I have displayed two more Napoleon porcelain rose figurines, these two figurines are a lovely deep shade of pink roses with stems and they are placed on top of the round silver trays on the left and right. 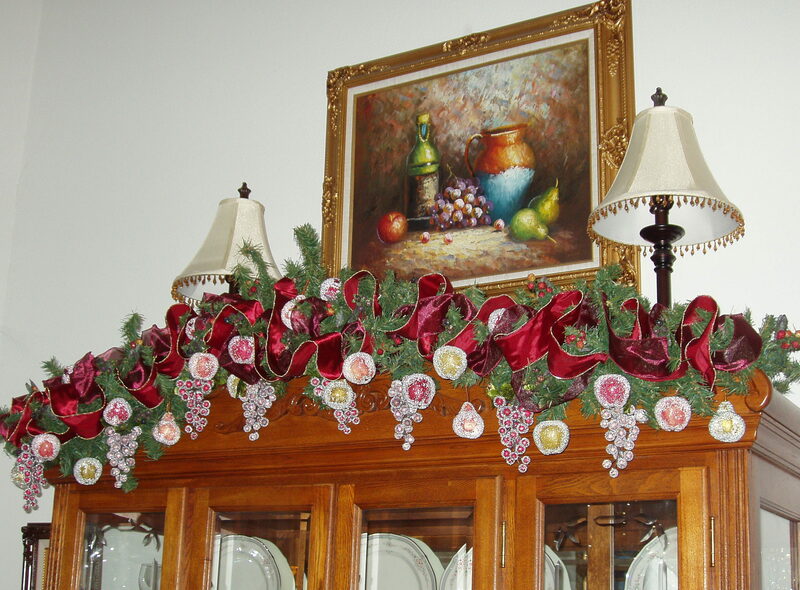 When decorating a china cabinet for the different holidays you will want to take into consideration that it is already filled with china, crystal and silver pieces so select just a few simple but elegant decorative seasonal items the compliment the colors of the china. 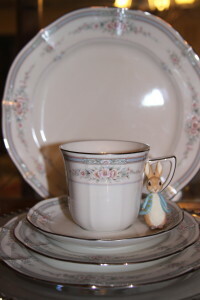 I am lucky because the Nortitake Rothschild pattern of my china is very neutral in color and the season items that I use blend very well with the other items already on display. 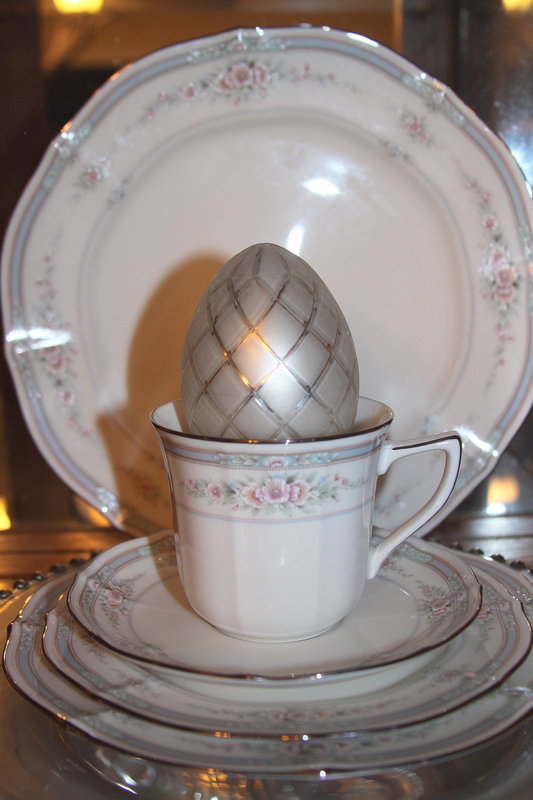 Several years ago I found four large silver and white glass eggs in a local retail store and for the Easter holiday I set the eggs inside four of the Noritake china tea cups which sit atop the stacked china place settings. I also have collected a Hallmark series of Peter Rabbit themed ornaments over the years and I display these around the china cabinet resting against some of the teacups. I think these Easter decorations add the perfect touch to decorating the china cabinet for the season. For the Fourth of July holiday I was looking for some patriotic decorations for the china cabinet. I wanted something that would match the elegance of the china, crystal and silver items already displayed in the cabinet. A few years ago I had purchased four large stars made out of mirrors and trimmed in silver and they looked wonderful placed in the china tea cups and are a simple and the perfect patriotic touch. 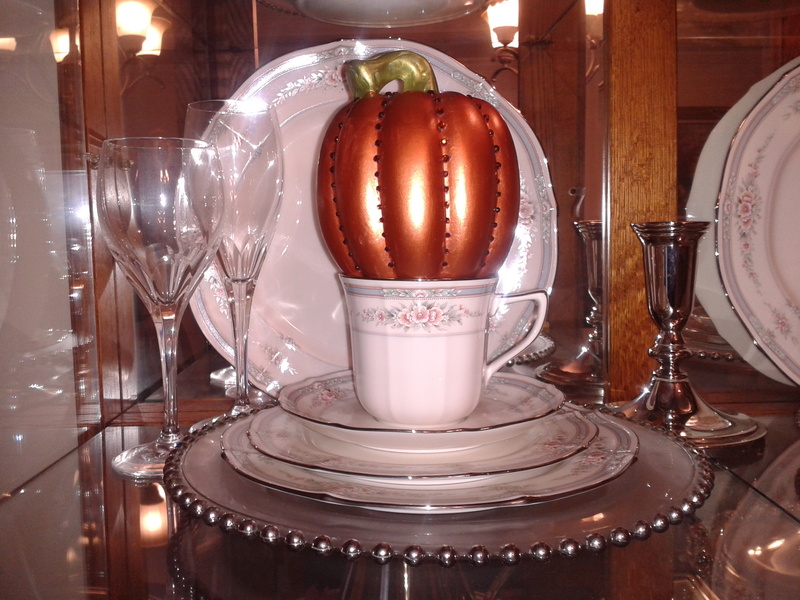 As you can see, there are a variety of ways to decorate a china cabinet. The important thing to remember is to keep the decorations to a minimum since the china, crystal and silver are the stars of the show! !